WISMEC Vicino Starter Kit is a perfect starter kit with the structure of replaceable cell and Dual Circuit Protection. With 3.5ml e-liquid capacity and both top & bottom Airflow , it is easy and convenient for vaping. As a simple vapor device, this WISMEC Vicino Starter Kit has 3.5ml e-liquid capacity, which is suitable for a starter vapor. With the structure of replaceable cell, it becomes much more convenient. It also has Dual Circuit Protection. You can choose two kinds airflow, top e-liquid Filling & bottom airflow control, both airflows are easy to operate. 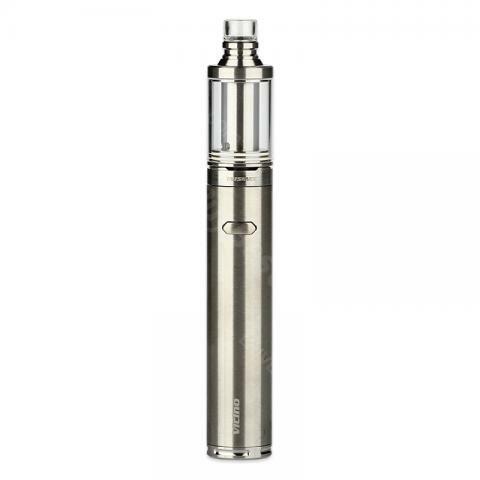 With High Power Atomizer Head, it is perfectly suit for the compact yet unique device. What else, here are two colors available, black or silver color for your perfect choice. Top E-liquid Filling: By unscrewing the top cap only, you can finish the e-liquid refilling quickly. Airflow Control: Unprecedented airflow that surpasses your needs. Replace Cell: By unscrewing the battery bottom cover, you can replace the 18650 cell easily and quickly. Charging: It is better to take out the cell and charge it through external charger.You can also charge the device by connecting it with a computer or a wall adapter via USB cable. Find die WISMEC Vicino super, leichte Bedienung , für die L?nge leicht in der Hand , hatte schön kürzere, die schwerer waren, Batterie hält bei mir gut 24 Stunden. I really love the design and look of WISMEC Vicino Kit on my mod.The flavor meets the need of mine. I really recommend it.